Breakfast is the most important meal of the day, it feeds the body thus feeding the mind. We are fortunate enough to be able to send our kids off to school with a hearty breakfast in their stomachs, ready to take on the day but for some kids, they head off to school hungry. When all you can think about is how hungry you are, how can you possibly concentrate to learn at school? It's incredibly sad but a reality in every school today. I am proud to say that our daughters school offers "The Breakfast Club" - a place where kids who haven't had any breakfast or haven't had enough breakfast can go and get something to eat before class starts. I think it is a fabulous program! 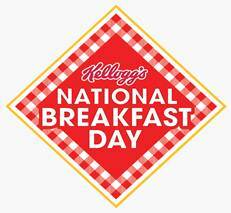 Thursday, March 8th is National Breakfast day across the country. Kellogg's has joined forces with Breakfast Clubs of Canada and Breakfast for Learning launching the "Share your Breakfast" program which was created to encourage Canadians to help those kids who otherwise go without. Studies show that breakfast can help kids boost their academic performance - improving behaviour, reducing absences and tardiness and increasing focus and physical performance. In Canada sadly, 1 in 10 kids live in poverty and often go off to school on an empty stomach. Throughout the day on Thursday, Kellogg's will be surprising Canadians with free mini packs of Kellogg's Rice Krispies cereal to raise awareness of our hungry Canadian kids. In return, they are donating to their National Breakfast Day partners. A bowl for you, a bowl for someone who needs it. Viewing and sharing the Kellogg's Breakfast Video via social media - let all your family and friends know! Pick up a specially marked box of Kellogg's cereal containing a pin code to redeem for a free small box, in return Kellogg's will make a donation to Breakfast Clubs of Canada and Breakfast for Learning. Visit the breakfast charities directly and make a donation. Find out about all the great work they are doing to help kids across the country. Help us spread the word and make mornings brighter for kids in need across Canada! Disclosure: Posted by AME in participation with the Canadian Kellogger's Network. All opinions and comments are those of AME.